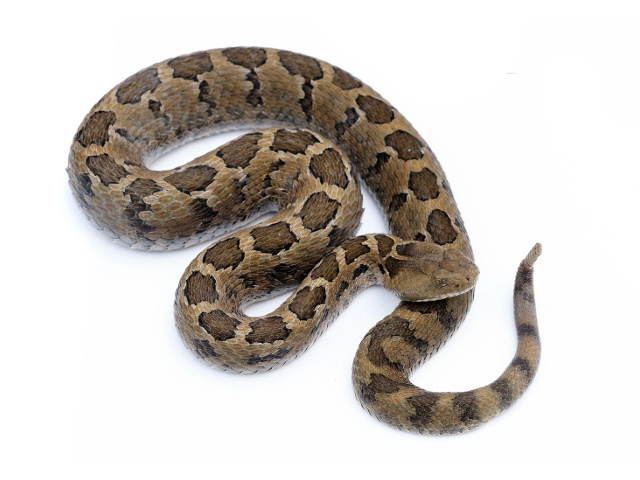 Crotalus ravus is a small sized venomous pit viper species. There are 3 described subspecies, C.r.ravus, C.r.brunneus and C.r.exiguus. The basic coloration of Crotalus ravus is usually brown or gray with a drawing of dark or rust brown spots on the back, which are bordered by narrow black scaly rows and are usually brighter to the center. The head is unmarked and on the neck there is a striking patch. Crotalus ravus are small species so large housing is not that necessary. An enclosure of 0.9 meters long, 0.45 meters width and 0.45 meters high (3 x 1.5 x 1.5 feet) is considered as appropriate. A slide-door or Lanzo type terrarium is a good choice for this species. This species prefer large and dark hideaways so you can use paperboard boxes or large tree bark as an example. I keep one hide spot on the cold side of the enclosure. You can choose between a big variety of substrates such as aspen, tree bark (small), peat moss and coconut fiber but you should avoid using sand or garden dirt as they can get dusty and can damage the snake’s respiratory tract. My personal recommendation would be a mix of peat moss and tree bark with leaf litter on top. Crotalus ravus is a high mountain species so it depends on the place you live if you’re using extra heating or not. Temps should be between 23-27 °C (73-80 °F) during the day and around 18 °C (64 °F) at night. If you live in a very cold place you can help yourself using a spotlight or a thermal plate so that temps will never drop under 16 °C (60 °F). My light cycles are different according to the season. For late half of fall – winter I keep 8/16 hours (day/night) and for spring – summer – first half of fall I keep 12/12 hours (day/night). This will work for both breeding and maintenance purposes. Always keep clean water in a large container but not too tall. It’s a good practice to change the water every 2-3 days or whenever the snake defecates in the water bowl. 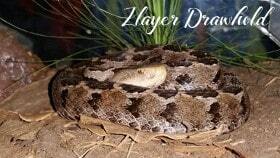 I keep my Crotalus ravus at the humidity level of 60-80%. Crotalus ravus feed primarily on mice. Prey must be offered according to the snake’s size. Some herpetologists say that they feed on insects as neonates but I have never seen that personally since I have always fed these snakes with mice and never encountered any major problem. I feed my juveniles once a week and my adults every 2 weeks. Crotalus ravus are usually easy to handle compared to other species. They tend to be calm and easy going when lifted with hooks but of course that’s not always the case so you should always be careful. No tongs are needed even with the most aggressive individuals. Use of tubes must be only for medical purposes such as probe test, tube-feeding or applying drugs. Depends on the type of substrate you are using. If using peat moss, coconut fiber, tree bark or aspen, spot cleaning of feces will work but try to change the whole substrate every 1 or 2 months (depending on the size of the enclosure). If using newspaper you must change it every week. They shed their skin 2-6 months, depending on the age and size. During shedding period is recommended to raise the humidity a bit.